Search Results for "couple scooter"
Young Couple on Scooter Enjoying Summertime. Slow Motion. 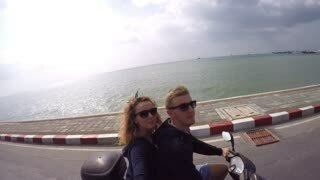 THAILAND, KOH SAMUI, FEBRUARY 2015 - Happy Couple Driving Scooter on Summer Holidays Vacation. Slow Motion. Beautiful Sport Young Couple Riding Scooter Together. Slow Motion. Happy Young Couple on Scooter Enjoying Road Trip. Slow Motion. THAILAND, KOH SAMUI, FEBRUARY 2015 - Beautiful Young Couple Riding Scooter along the Sea. Slow Motion. Cheerful Young Couple Riding Scooter in the Street. Slow Motion. Couple Driving Scooter on Road on Tropical Island. Slow Motion. Cheerful Romantic Couple Riding Scooter on Island. Slow Motion. THAILAND, KOH SAMUI, FEBRUARY 2015 - Happy Couple on Scooter Enjoying Trip at Summer. Slow Motion. Couple riding scooter and smiling. Woman holding US flag. Happy citizens of America. Life couldn't be any better. UNITED STATES 1950s: Animation of two wheels on a page.Animation of scooter components. Young couple hold hands and walk past Scooter on street. Couple ride scooter through suburbs. 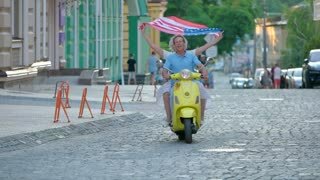 Two couples on scooters wave and smile at each other. Mature couple eats ice cream. Man sitting on a scooter. Let's make a short break. Trip to Europe in summer. UNITED STATES, 1950s: Three people arguing in front of garage. Three people nod and smile at camera. Honda Scooters in front of garage. Lady riding a red Honda scooter. Young couple smile as they ride a Honda Scooter.